Best job of 2009. | Andrew Sutton, R.G.D. Sometimes family and business don’t mix. I’d argue that that depends on your family. This project was a common-look-and-feel for a suite of parts for my brother, Mike Sutton, to brand himself as a Kingston-area realtor. Being brothers you might think that it was hard for us to keep our opinions to ourselves and that this might disrupt the creative process, but you would be wrong. I was determined to give him exactly what he wanted and he was determined to give me absolute creative license. Our only hindrance was the confines of the real-estate industry’s legal necessities when it comes to marketing. Thanks Mike for a fun project and a great end-product. 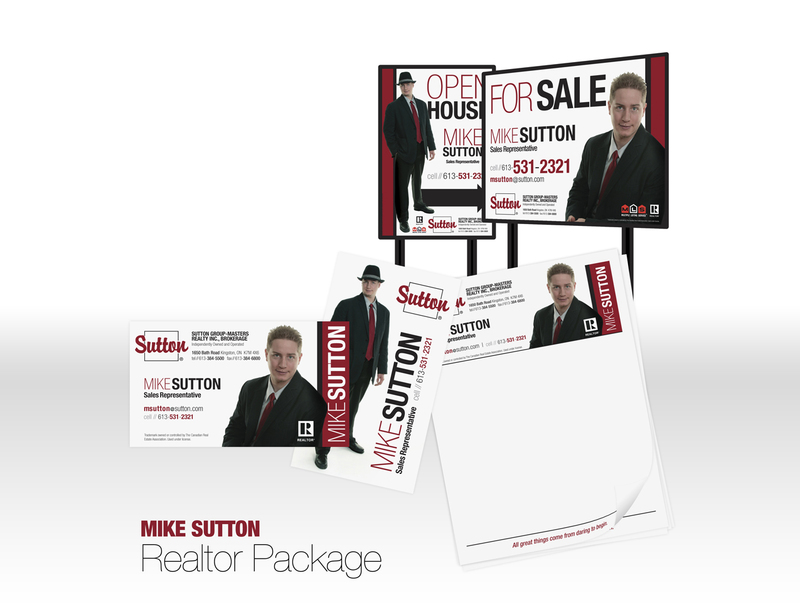 This entry was posted in g33kDESIGN and tagged Business Cards, Corp I.D., Corporate Identity, Graphic Design, Kingston, Layout, Mike Sutton, Real Estate, Realtor, Sales, Signage, Signs by Andrew. Bookmark the permalink. I've seen him in local papers and thought that was Mike but i dismissed it thinking it was just a coincidence. That's my Bro! He's selling houses like mad. It's only his first year but you can already tell he's going to be a big player in the Kingston RE market.